It's time for another trip into the world of lovingly detailed miniature dinosaurs, as photographed by Jane Burton (with commentary from Dougal Dixon, because it was the 1980s). For those who missed the first part, FOR SHAME! Go back and check that out first - it's worth it for the Saltopus alone. In addition, I don't want to have to introduce the book again. I've got a stinking cold, you know, and am here as long as the mug of Lemsip lasts. Anyway, without further delay, here's a slightly psychedelic hadrosaur! 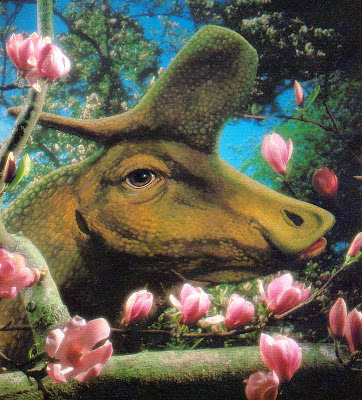 While I appreciate a sudden explosion of pink blooms in a book otherwise filled with rather earthy tones as much as the next person, there's something quite uncanny about that eye.This picture is also rather jarring in that there aren't really any other close-ups like this in this book - this flower power Lambeosaurus profile shot seems a bit out of place. Ah, that's more like it. As with the best shots in this book, there is an effective illusion of scale here, while the two Pachycephalosaurus models are wonderfully detailed and superbly posed, flashing their bright blue heads at one another. By far the best shots in this book are those that avoid any gimmicks and remain sharp and in focus, but this can also result in scenes that are rather static and dull. Having two animals displaying is an effective way to circumvent that problem, as it adds drama to the scene. This is further bolstered by the text, which describes this encounter as the warm up to a full-on headbutting session. 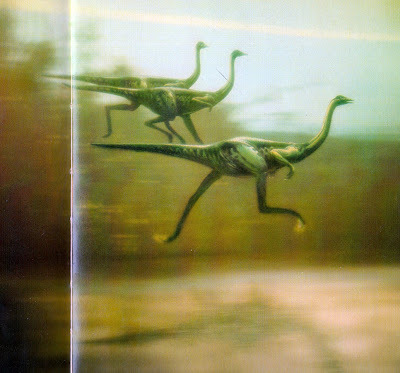 Where there is an attempt at gimmickry - as in the motion blur around these Struthiomimus - things can start to fall apart. Here, the blur is so extreme that it makes the animals look as if they have been fired out of a cannon; it doesn't help that the individual in the foreground appears to be flying over the water. Yeah, we get it, they were fast. As I mentioned last week, there are only a couple of attempts at sauropods, and it's easy to imagine why - making tiny models of such huge animals look convincing in a photograph must be very tricky indeed. 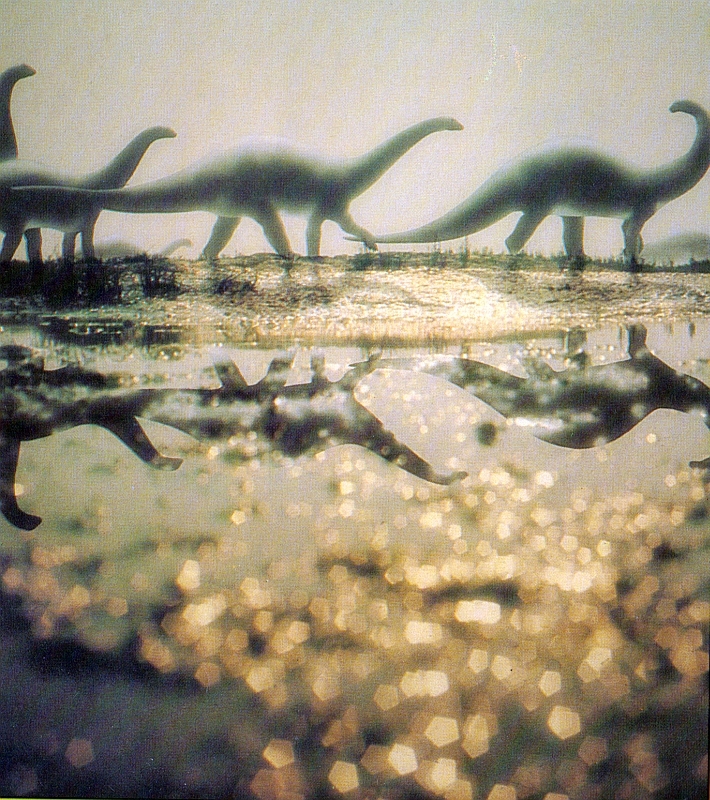 This Apatosaurus pic is a pretty decent attempt, and certainly a good job is made of forcing the viewer's perspective to create an illusion of depth. 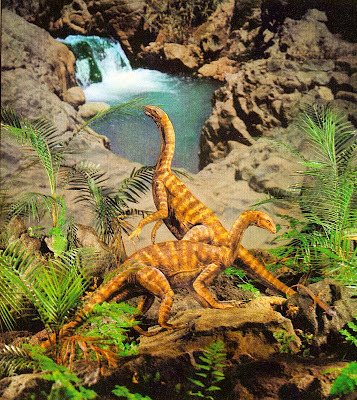 It's also rather pleasing to see that the dinosaurs are up and active, with elevated tails, although admittedly this was becoming more commonplace by 1984. 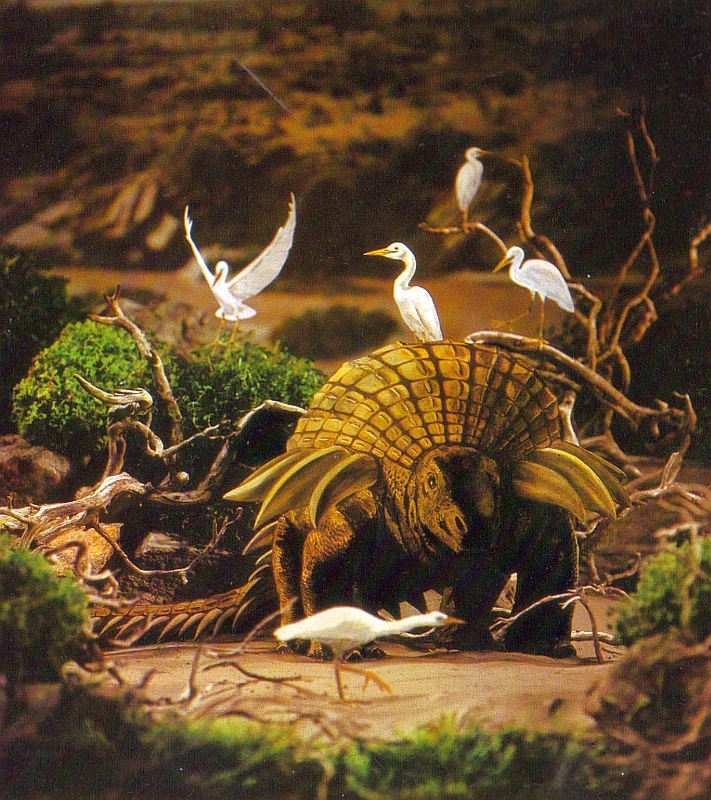 Here we have some egret(-like bird)s, and...an ankylosaur. But which one? It looks rather similar to Edmontonia, but - just to remind the reader that this book has plenty of throwbacks to the Palaeontology Dark Ages - it's labelled Palaeoscincus. 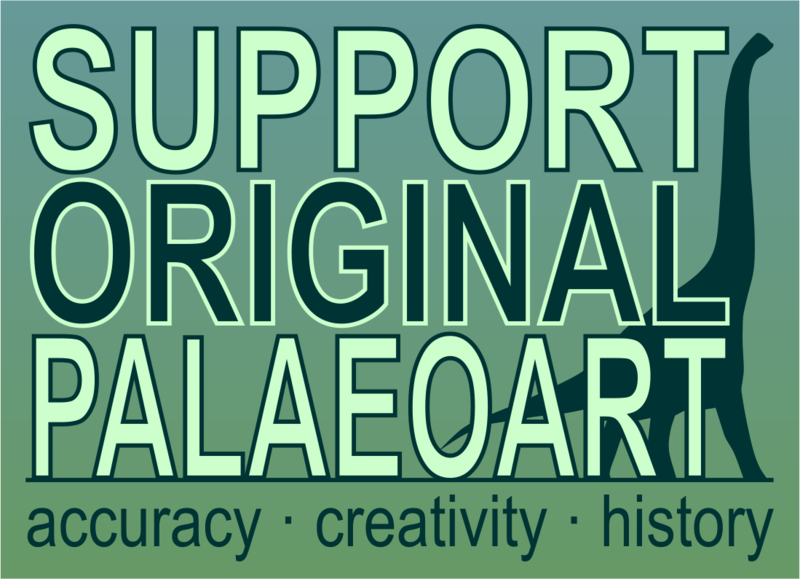 Palaeoscincus, like the better known Trachodon, is a very dubious genus based on teeth that nevertheless popped up a lot in dinosaur books, and most specimens assigned to it have since been reclassified. Taxonomic issues aside, though, this is definitely one of the better photos - the model plants and the interaction between the dinosaurs give it a pleasingly naturalistic feel, and the lighting is superb. Thecodontosaurus now, and another lovely scene. Perhaps the background doesn't quite fit in terms of perspective, but the composition is effective at simultaneously showing off the animals and, through the use of vegetation, drawing the viewer into the scene. I'm not sure you'd get away with a quadrupedal Thecodontosaurus these days, but this remains a beautiful depiction of a dinosaur that doesn't get an awful lot of attention in art. 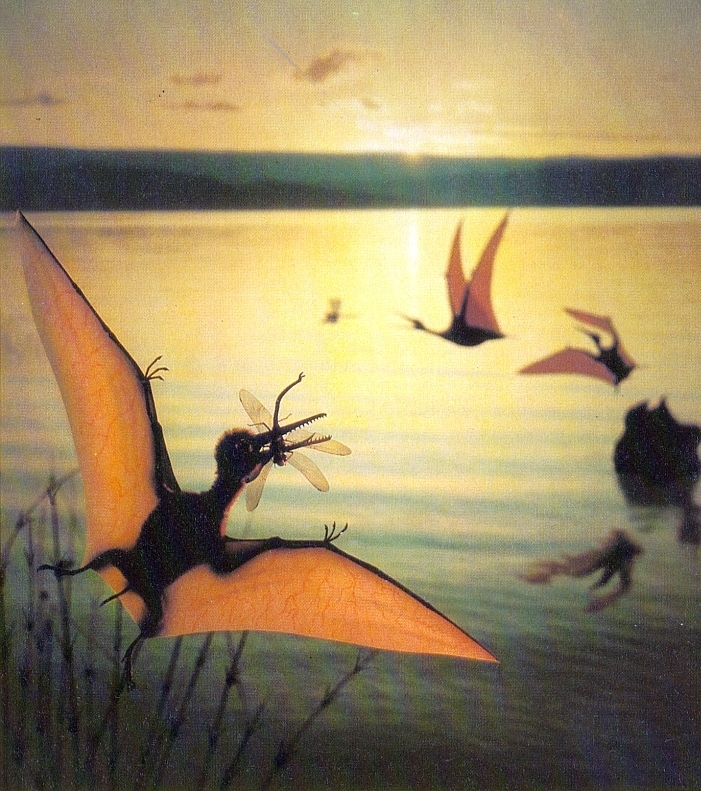 Pterosaurs are often pretty nightmarish when they're done right, but tend to be much, much worse when people get them wrong. 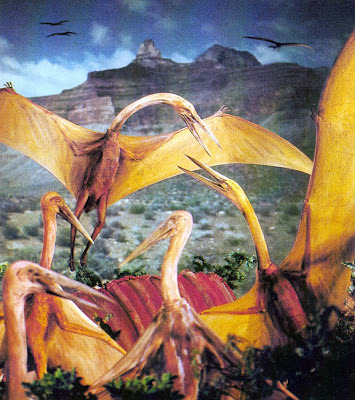 This depiction of Quetzalcoatlus is certainly an improvement on many of those that came before it (which often had tiny, teeth-filled heads), but is still pretty bizarre. It seems to be rather lacking in musculature, and its neck looks like it's been glued on to its body; that head is still a bit too small by comparison. Rather typically for the time, the animals are portrayed skulking around a huge slab of prime rib. Brrr. I need to go and lie down with an ice pack on my head and a thermometer wedged in my mouth, feeling sorry for myself, but here's another of my absolute favourites to finish things off for now. The model might be outdated (it's Pterodactylus), but the execution of the photo is superb - the lighting in particular is excellent, and this really does just look like very fortuitous nature photography. Gorgeous stuff. Surprised more ppl haven't commented. Aw well. "Ah, that's more like it. 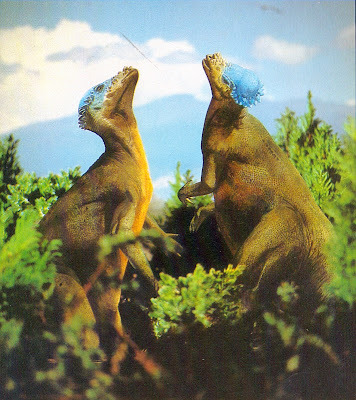 As with the best shots in this book, there is an effective illusion of scale here, while the two Pachycephalosaurus models are wonderfully detailed and superbly posed, flashing their bright blue heads at one another." IIRC, this pic was also in "Eyewitness Dinosaur". In any case, I've always liked Burton's blue-headed pachycephalosaurs. To quote Martin Kratt, "not enough animals are blue" ( http://www.youtube.com/watch?v=c_q4VyMbSk0&feature=plcp ). Any idea how likely it would've been? "I'm not sure you'd get away with a quadrupedal Thecodontosaurus these days,"
BTW, did the LITC crew get my email? Just making sure. P.S. Hope you feel better. Thanks Niroot. I knew some "prosauropods" are now thought to be obligate bipeds, but I wasn't sure which ones (besides Plateosaurus). I still have that book and I really liked it as a kid !